five days a week ground fishing boats (draggers, gillnetters, and long-liners) deposit their catch from the gulf of maine and georges bank at the fish exchange where it is sorted by species and size before being auctioned off then shipped in 300 to 1200 pound lots. The past two winters my alarm would go ring at 2:45 a.m. sunday through friday, getting me up for the early shift. at least i didn't have to drive through the snow, as i could see the front door from my apartment window. 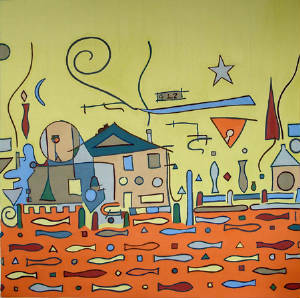 the original painting is 36 inches square.